Step 3 - Tear viewer's heart out when relationship is destroyed or strained by the world. This applies to almost every Makoto Shinkai work I have ever seen. 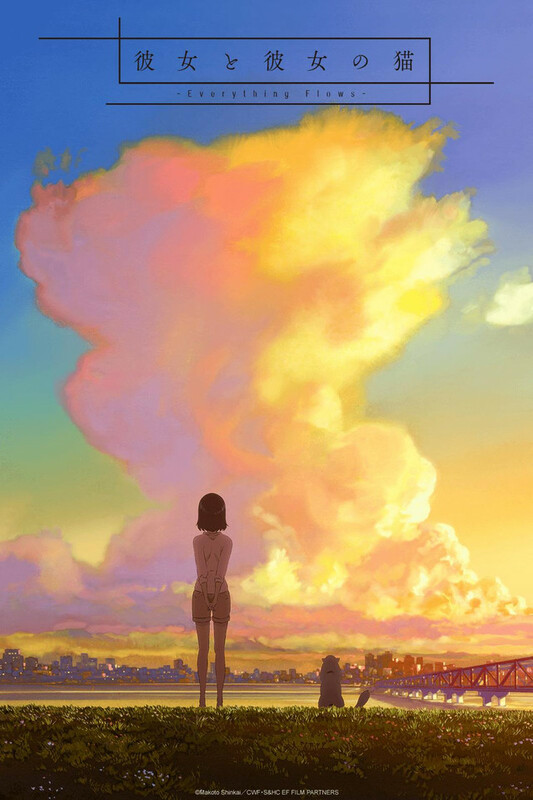 Using beautiful stills and animation in combination with nostalgic sounds (cicadas, rustling leaves, rain), Shinkai creates a simple and powerful picture of a world centered around a single relationship, flooding the viewer with he feelings associated with it. He then takes it away or strains it, pretty much shattering that world. This has been Shinkai's calling card since the original She and Her Cat (1999) and his retelling of Orihime and Hikoboshi in Voices of a Distant Star (2002), which re-frames an interstellar conflict as the heartbreaking story of two lovers separated by a sea of stars. His use of the elements (clouds, rain, snow), sound, and symbolism immediately caught my attention as it has a lot of similarities with non-Japanese schools of poetic cinema (e.g. integration of rain in Voices of a Distant Star reminded me a lot of the works of Tarkovsky, especially due to its symbolism in Orihime and Hikoboshi ). That said, I feel like Shinkai's characters tend to have really unhealthy obsessions with past idealized relationships as in Voices of a Distant Star and 5 Centimeters Per Second. It sort of grates on me if I'm not in the mood and I think it's the center of most criticisms of Shinkai. Human: "Why would you be mean to me? I did so many great things for you." Kitteh be like: "What have you done for me lately?" Human: " I put out food for you this afternoon." Kiteh: "Quiet, silly Humon. I need to look for small animals to torture and kill." It's really early to write a review, but 7 minutes in, I can tell this is straight up Makoto Shinkai. You either love him or you hate him. She and Her Cat -Everything Flows- quietly proclaims what every pet owner already knows--that there exists an intuitive emotional bond between person and pet. And this is truly an amazing realization, especially in that both people and animals are so instinctively territorial. The implication is that not only do we consider pets to be part of our families, but that they also share that idea. This series follows its young female protagonist as she begins living on her own, with just the company of her childhood pet Daru, who narrates. (His is a language of subtleties, of gentle emotional cues.) Prepare to be moved by a delicate story of love and loyalty unfolding in the face of an indifferent world. This has to be both the saddest and most beautiful thing I have seen in years; a real tear jerker. Everything from the concept, the storyboard, the animation and the dialogue was beautifully done and aimed at opening the viewer's eyes to the simple things at life that should be treasured more. Short and sweet to the point it was almost too short, and it left you sobbing into your pillow and wanting more. Well done all round. I totally recommend it. I went into She and Her Cat -Everything Flows- without having seen the work it is based on. The beautiful cover art and the description of the story instantly made me expect some light entertainment, a "slice of life" series full of silly humor and sturdy plot lines. Instead, I was offered one of the most profoundly emotional experienced I've ever had with an anime series. It touches upon deep themes like solitude, existence and expectations. It asks rather clever questions, while also being incredibly subtle and objective about it. How far should we go to ensure our own happiness? How far should we go to ensure the happiness of others? What makes life worth living in the end? It's an incredible feat for a show that only lasts about half an hour in total. The four episodes offer an intimate look into the daily life of a young woman and - more importantly - the bond she shares with her cat, Daru. Most events are seen from his point of view, and there's something quite touching about the simplicity of the execution. Daru is not a fantasy creature capable of understanding human speech and logic; he's an animal through and through, yet still full of love and compassion toward his owner. It is a bond that many a pet-owner will recognize. As a former pet-owner myself, I can safely claim Daru's unspoken love resonated within me to a point where it was almost hurtful to continue. At the end of the last episode, I found myself moved to tears; not because it was overly sentimental or ripe with sorrow, but because it felt so honest and real. This was truthfully a beautiful surprise, one I will treasure for years to come. I believe it is an anime, which everyone should watch at least once! It's very Ghibli-esque in it's approach to anime as art, capturing basic and natural bonds of affection in the most vivid way. The animation can be simple because the message it conveys with warm hues of love is enough to touch you at the very core. As everyone with a pet (or any relationship at all) knows, the years between you foster an unspoken comfortability and affinity that is personal on the deepest level. Each relationship is precious because of the uniqueness of two individuals coming together. It must be the most fundamental closeness and love because of the lack of communication with your domestic furred friends. In short, you cannot say it, but you know you love one another. Welcome to She and Her Cat. For having just four episodes that clock in for a total running time of just under a half hour you wouldn't think that She and Her Cat -Everything Flows- could really pack such a powerful emotional punch as it does. The show's strength is that the story doesn't try to tell you all the details. Rather much of the background information is inferred. The writer gives you just enough information that you know exactly what's going on, but there's nothing being crammed down your throat. I really like how the cat and his owner both share in the narration duties of the story, but yet they're both totally unaware of just what exactly the other is thinking. Rather it's their feelings which carry through. I'm not going to lie, this is an entertaining series. As a person who doesn't own pets, it's refreshing to see what it's like to own pets from a new perspective. She and Her Cat is one of those short anime that has an 8 minute run time and uses those 8 minutes per episode to their fullest. Let's get into the meat of this review though. Simple concept. A college student lives with her cat. Here's the twist: It's from the perspective of the cat. It's a nice twist, but it isn't a mind blowing concept. For what it does, it does well. It engages the audience, has a nice pace, and has a good idea of what it wants to be. Since it's a show about a college student, it would make sense to have some kind of conflict. The daily troubles of college students (getting a job, paying bills, etc.) allows the audience to relate with the main female character. This show does know what it's doing, but the mundane is still mundane. Nothing crazy is going on, and although this isn't a bad thing, a little more conflict would be nice. This series even states in the first episode that (from the perspective of the cat) the main female character does the same thing every morning. This is used to highlight how, even in the face of hardships, the main female character can stay strong. It's a nice idea and it's well executed. For what this show does, it does well, but it doesn't go above and beyond with most of its ideas. It seems a little TOO emotional at times, but this doesn't cause many problems. The ending is predictable, but I'm glad it doesn't go down the "everything ends up perfectly and there are no problems whatsoever" route. The show has a realistic portrayal of what it's like to own a cat. It shows both the good and the bad and hoe attached people can get to their pets. I appreciate this turn, but as stated, is predictable. There isn't really a way to make the ending unpredictable so I won't hold that against the anime. It was also foreshadowed too, which is nice on a storytelling perspective. There are only 2 characters as of episode one. Let's split this section between the two characters. The cat is simplistic. The cat knows its limits for what it can and can''t do to help and is grateful for its owner. He tries to comfort his owner and that's about it. Since we see the world through his eyes, we are restricted to the house as the setting. This adds to the idea of this anime being mundane. The main female character is characterized well. She is a strong, independent woman who doesn't fall in any of the tropes normally seen in anime. She faces hardships to her fullest and keeps trying in the face of failure. This allows the audience to relate with her struggles more easily and makes the story have a larger impact. You can see the bond between pet owner and pet within the first episode through the dialogue and through actions. This show utilizes the show, don't tell aspect of a visual medium most of the time, but falls off the deep end at times with how certain things are explained. The characters and characterization is, overall, strong and a breath of fresh air. The animation is beautiful, but as stated, the setting is in a house. There isn't much to mess up. When visuals of the outside world are shown, they are well drawn and attract the audience's eye. The art style is a little different from the norm, but again, it is a breath of fresh air. The voice actors are well chosen and fit their roles well. They don't over exaggerate their dialogue, which is nice. I don't like when a small conflict turns into a crying and yelling fest so it's nice to see external conflicts handled realistically. The music is also fitting, and the ending is soothing. That's another theme of this show, it's calming. Everything comes together to make a simplistic and calming story with some minor conflicts to keep the characters with something to do. The music adds to scenes, but nothing has stood so much yet that I would add it to my music playlist. This is a nice show to watch to relax. It's relate-able to both pet owners and people who go through mundane conflicts. It's relatively short episode lengths are good for quick viewing sessions while waiting around or to fill a quiet room with some noise for a little. Nothing stands out too much because of the perspective we are given, but this perspective also adds something new that we haven't seen much before. For what this show has to offer, it's worth a watch. I rate it a 4/5, but because it doesn't stand out in how it presents itself, I would say a 7/10 (3.5/5) is more deserving. I'm editing this review each episode to ensure the highest amount of accuracy in it. The first episode is a charming and insightful view of the internal and external struggles of a young person viewed from the perspective of her cat. The cat makes an interesting spectator/reporter: on the one hand adoring of his human and on the other a witness to her undisguised experiences and adventure. This unusual perspective feels magical, creating an instant bond with She and Her Cat. This series, of all the anime I've watched, is probably most worth watching. Not just because it's good, but because it's so short. It manages to pack as much feeling into a total run time of around 30 minutes as many anime series barely manage in two seasons. I'm not even a cat person and I recommend this show. Well worth the watch. Worst case is you lose 30 minutes of time. A tear-jerker with a realistic cat. I feel like it's so hard to find any kind of media with accurate portrayals of cats and this is one of the few that does it. It's also a great emotional series that only stayed for as long as it needed and ended beautifully. One of the very few series that made me cry real tears too. I highly recommend anyone should watch this. Based on one of Makoto Shinkai's earlier works, She and Her Cat -Everything Flows- follows the life of a college student and her black cat.